ElectroBSD is commonly used on systems with 2 GB of RAM or less, it therefore uses the ZFS ARC patch written by Karl Denninger for FreeBSD to let the Adaptive Replacement Cache (ARC) actually adapt its size when the memory is needed elsewhere. 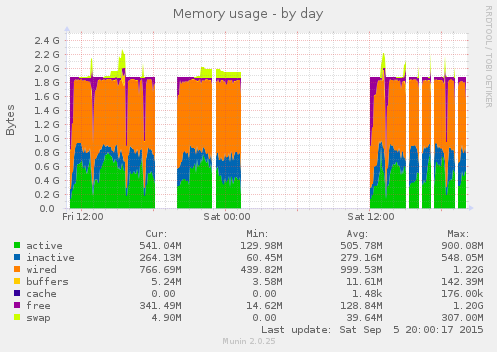 What the graphs don't show is that the monitored system still behaved unsatisfactory while under memory pressure. Running "git checkout" or "git rebase" in /usr/ports while using Emacs, Claws-Mail and Firefox with a couple of open tabs was not a pleasant experience, especially if the ARC was still cold. Applications would frequently become unresponsive for a couple of seconds, despite not having an excuse like being partly paged out or waiting for data from the (busy) disk. Obviously unresponsive applications are annoying, thus DTrace was used to track down the cause of the issue. The rate limiting wasn't working as expected, among other things because the autoreap variable in the reclaim thread wasn't declared static. consider_reaping_arc_caches() was added as a wrapper around reap_arc_caches(). It is executed at least once per second but more often when the ARC is under memory pressure. A time-based rate limit controlled by vfs.zfs.arc_reap_delay_min prevents the ARC reaper from hogging too much system resources. More importantly, the user experience under memory pressure has improved accordingly. In case you are wondering: The cause of the outliers at the end has not yet been investigated and it's unknown if they also occur when DTrace isn't running. This page was made from incomplete notes created while experimenting. I did not (yet) investigate how vanilla FreeBSD would perform under similar circumstances and you should not draw any FreeBSD-specific conclusions from this page without DTracing the workload you care about yourself. While an unpatched FreeBSD reaps the ARC caches from a potential hot path that can impact arc_get_data_buf() through a shared lock, it does it from a single thread so there should be no collisions and a lot less lock contention than with the ZFS ARC patch mentioned above. 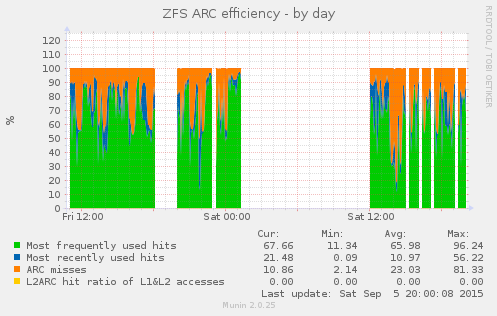 If you want to experiment without waiting for the ElectroBSD release, feel free to try the zfs-arc-tuning.diff (experimental) which includes the fbt-time DTrace script and should apply more or less cleanly against vanilla FreeBSD 11-CURRENT once the ZFS ARC patch from the PR is applied.